While convenience is a favourable factor, the feeling of living in a community is another. “Most of the members are migrants staying away from family,” said John Jacob, associate vice president at CoHo, a Delhi/NCR-based co-living startup. CoHo, which has raised $3 million so far from wealthy individuals and family offices, organises weekly events like pizza-tasting sessions, poetry nights and movie screenings at its co-living spaces. 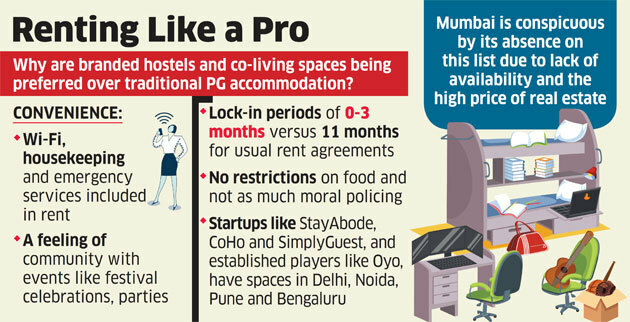 Oyo’s offerings have dedicated Skype corners and phone booths for homesick millennials who want to keep in touch with family and friends, according to Kavikrut, chief growth officer at OYO Hotels & Homes, which operates rental spaces under the brand name Oyo Living.